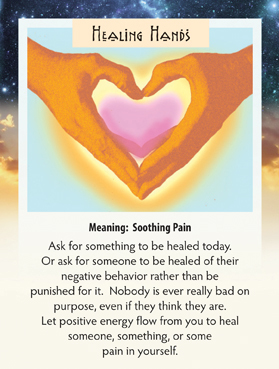 This week we have drawn the Healing Hands card. This is special for me for several reasons, but most importantly it gives me an opportunity to tell you about an online meditation that was sent to me today, available to anyone and everyone. It a simple guided meditation that lasts 11 minutes and feels just wonderful. We are in such stressful times and this card indicates we should ponder healing something or someone or something in ourselves. In ourselves, that can be anger, jealousy, fear, hurt or resentment. Those negative emotions can translate into pain in your body if you allow them to fester inside of you. So this week if you feel a negative emotion, hold your hands over your heart and ask to release that feeling from your body. It doesn’t mean that you even have to share that with anyone, even the other person involved if there is one. It is just about you and feeling as good as you can as much as you can. It is the best way for all of us to deal with the added stress of these times. Here is the link to the meditation. If you can find the time to do this, you will truly feel better for it! I hope you all have a wonderful and healing week! Thanks for posting the heartfiregateways meditation. Loved it.